MSPs are returning from their holidays for a new term at Holyrood. Brexit continues to dominate the political agenda, but what else will politicians have in their in-trays as they settle back in after the summer recess? No, there won't be any getting away from it. You can't move six inches in politics without tripping over Brexit. There's every chance that within the month, the wheels will have fallen off the political clown car and we'll be staring down the barrel of a snap general election or another referendum. But until the next seemingly inevitable crisis, Scotland's politicians have plenty to be getting on with. New ministers are settling into their jobs after June's dramatic reshuffle, and legislative proposals are piling up. Here's a (relatively) Brexit-free guide to what MSPs will be focusing on over the next few months. It feels like it hasn't been long since Finance Secretary Derek Mackay's last set of budget negotiations, after the major changes to Scotland's income tax system agreed last time out. We're not expecting Mr Mackay to propose big changes again this year - he says we now have a "settled structure in income tax policy" which can "provide certainty for the rest of this parliament". The problem with that plan is that the SNP remains a minority government, and all of the likely partners for a budget deal are hungry for more change. The Greens, who helped Mr Mackay pass his last two budgets, are looking for major reform of how councils are funded. They began hammering away at this even while announcing last year's deal, and are determined not to look like a cheap or easy option. A pact with the Conservatives - a regular occurrence the last time the SNP had a minority administration - now seems an outright impossibility, while Labour will probably price themselves out of any possible deal with their calls for far more "radical" use of tax powers. That leaves the Lib Dems, who tend to ask for extra funding for mental health services and education. Those don't seem out of line with the SNP's current priorities - could this be Willie Rennie's year? Nicola Sturgeon will today set out a programme for government for the coming term, but most of these bills won't even be tabled for months to come, while consultations and drafting exercises are carried out. For that same reason though, there's still plenty of work to do on many of the 16 bills the first minister announced this time last year. One of them, the flagship Education Bill, has been shelved, with ministers now saying they hope to push through reforms without the need for legislation. The tricky thing with legislation being, it might not pass. Some other bills command broader support, and should complete their journey to the statute book this term. The organ and tissue donation bill, setting up an "opt-out" system for organ donation in Scotland, appears set to sail through. Wales already has this kind of set-up in place, and England looks set to follow suit. A bill raising the minimum age of criminal responsibility from eight - the lowest in Europe - to 12 has also been broadly welcomed. The government is also set to support a members' bill from Green MSP John Finnie banning the smacking of children, more or less guaranteeing that Scotland will become the first part of the UK to outlaw physical punishment of children. But on other fronts, ministers can expect to see opposition parties attempt to rewrite or even block their legislation. As noted above, the Education Bill was shelved at the end of last term, with the government hoping to negotiate a safer route by implementing changes that MSPs don't have to vote on. This doesn't mean Education Secretary John Swinney will be having a quiet year. Opposition parties have taken aim at the national assessments system, which sees children undergoing tests from P1 onwards, and may well launch a bid to have it scrapped. Mr Swinney has defended the system, saying the tests provide data to help close the attainment gap in schools, but set out some changes to address "issues" flagged up by teachers last week. 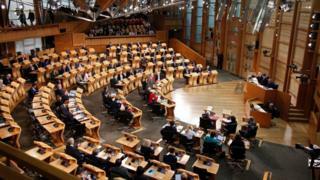 The Scottish Conservatives have thrown their backing behind parts of his agenda, which should provide some breathing room, but have joined other opposition parties in standing against P1 tests - making that topic perhaps the biggest headache in the immediate term. Ms Sturgeon has opted to add another experienced hand to the education team, appointing former rural affairs secretary Richard Lochhead a junior minister for the department, taking on the spot vacated when Gillian Martin was abruptly withdrawn just before recess. The Scottish government insists it is showing "international leadership" on climate change, but could face a rather more domestic scrap over its plans. Ministers have set a target - to be enshrined in the Climate Change (Emissions Reduction Targets) Bill - of cutting greenhouse gas output by 90% by 2050. However environment groups want ministers to go further and set a "net zero" emissions target, for Scotland to be effectively carbon-neutral by mid-century. Scottish Labour and the Greens are behind the campaign, meaning the government is sure to face attempts to amend its legislation. A whole range of moves to shake up Scotland's public transport network are under way, with ministers proposing reforms to bus travel, low-emission zones in cities, a ban on parking on pavements and improvements to smart ticketing schemes. The idea of having a public-sector train operator also persists, although the next point at which there might be a bidding process is 2025. Elsewhere on the rail network, plans to merge the work of the British Transport Police north of the border into Scotland's single police force appear to have hit the buffers, with the government now reviewing "further options" on how to devolve responsibility for railway policing. No wonder the transport portfolio has become a full cabinet secretary brief - one which will keep Michael Matheson very busy. Opposition parties concurred that the draft Transport Bill tabled in June was a "missed opportunity", and will be planning wide-ranging amendments when it arrives in committee. Fracking? Didn't they decide on that last year? Well, no, it turns out that technically, they didn't. Ministers announced in October 2017 that fracking would have no place in Scotland's energy mix, saying that the long-running moratorium on the controversial oil and gas extraction technique would continue, becoming an "effective ban". But when petrochemical firm Ineos, owner of the Grangemouth refinery and holder of some fracking licences, tested this position in court, they were somewhat surprised to be informed by the Scottish government's lawyers that fracking isn't banned after all. The prohibition announced by ministers was in fact a "preferred position", due to be cemented in the policymaking process this October. To be honest, this should be a formality. MSPs voted overwhelmingly to back the government's position last time round, and will do so again. There will doubtless be a row, though, and potentially not just from the Conservatives, the sole party backing fracking at Holyrood. We may also hear more from the Greens and Labour demanding a stronger block, possibly one grounded in law. Another one of Holyrood's long-running legislative sagas - the named person scheme - could get a fresh airing later this year. MSPs approved plans in 2014 to appoint a named person, usually a teacher or health visitor, to be responsible for ensuring the welfare of every child in Scotland. However legal challenges put the brakes on the proposals, and the Supreme Court ruled against it in 2016 due to concerns about information sharing provisions. Ministers insisted they were still behind the policy, and attempted to resurrect it via a new bill to re-draft the parts the judges had taken issue with. However Holyrood's education committee stepped in to block the progress of this, refusing to sign off a report on the new bill until they could see a draft code of practice for named persons. That draft was due to be completed this month - but this has been delayed still further due to the school holidays and ongoing consultations. It is however due to be complete in the "autumn", meaning there could be scope for the dispute over the policy to resume shortly. If we're not talking about Brexit, how about Scotland's other constitutional conundrum? OK - but be warned, the two have become closely linked. Nicola Sturgeon has repeatedly pledged to update MSPs on her plans for a second independence referendum this autumn. She says she'll do this in October - but noted in August that she had no idea what the update might be. The first minister's original position was that she would decide on the timing of a new referendum once it was clearer what the UK's future relationship with the EU would look like. With that clarity still seeming like a distinctly distant prospect, commentators including polling guru Professor Sir John Curtice reckon Ms Sturgeon will kick indyref2 into even longer grass. It certainly seems like there would have been a bit more build-up work going on over the summer, if a referendum campaign were about to be launched. And with the SNP not moving to debate their "growth commission" blueprint for independence at October's party conference - instead saying they will discuss it next spring - anyone hoping for a fresh vote in the short term looks set to be disappointed. But equally, things move very quickly in politics nowadays - and often in unexpected directions. Brexit-related turmoil at Westminster could reach fever pitch in October, around the time Ms Sturgeon will have a conference speech to think about. Might it also be significant that Ruth Davidson, arguably the strongest pro-Union campaigner in Scotland, is heading off on maternity leave shortly? We're also due a ruling from the Supreme Court on whether Holyrood's Brexit bill will be allowed to stand, which could potentially set up yet another face-off between the governments in Edinburgh and Whitehall. In the current atmosphere, don't rule anything out.